For over 200 years Rome was a Kingdom, 500 years a Republic and 500 years an Empire. The Roman era was rich with history and encompassed a vast area having many administrations and a variety of cultures as they conquered and assimilated. 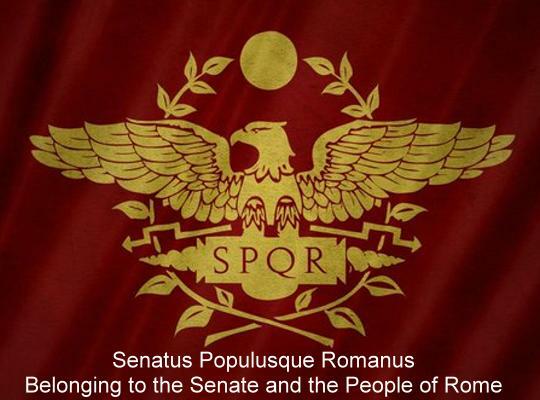 They had a collective view of themselves as a single people which is perhaps most evident with "SPQR" stamped on publicly owned assets – "Senatus Populusque Romanus" – Belonging to the Senate and the People of Rome. From the ancient Roman Republic (509 BC) to the fall of the Western Empire (476 AD) with the extinguishing of the "light of Rome" in the dark ages. Not including the Bizantium eastern empire which lived on until the dawn of the Renaissance. Romans carpenters made enormous steps in construction techniques which remained unequaled for over a thousand five hundred years, if not more. Advancements in concrete and the arch, in Greek architecture a single stone lintel would reach between columns at most 21 feet a Roman brick arch could span 150 feet. 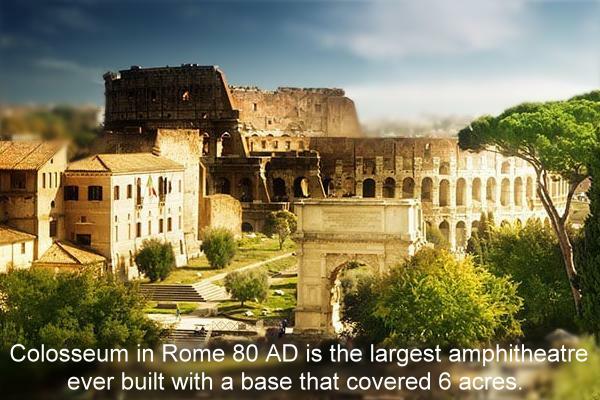 75,000 miles of roads including 29 highways that lead to Rome including 220 miles of aqueducts just in the city alone and built over 900 bridges in their empire. They assimilated and improved construction techniques especially through their orginization with massive building projects by excellent craftsmen that lasted for centuries. Carpentry advances we become better at what we do making peoples lives more comfortable. We develop beautiful achitecture based on what we learned from the Greeks and techniques that will take a 1000 years to re-discover. Our tools get better from our brother metal workers and the Roman Empire allows us to start small orginizations that take care of ourselves called Collegia. We educate one another and take care of our sick and retired, these guilds of ours will later save the Medieval world. Despite what is happening around us we build monuments of the highest architectural excellence, that we pass down to future generations. 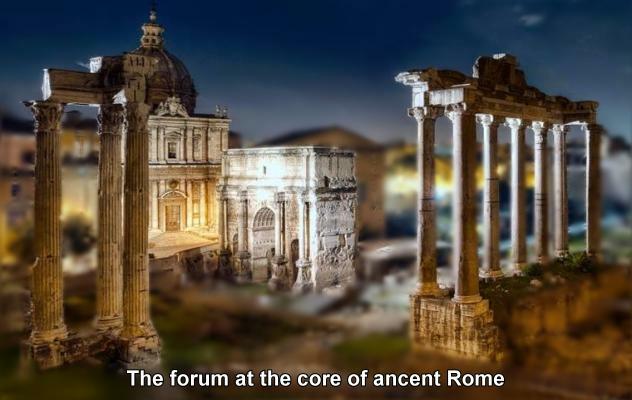 Roman society changed over the course of its 1000 year history but the class stucture remained essentially the same, basically Patrician, Plebeian and Slave. Patricians were the upper class aristocracy, wealthy influential landowning families with more voting power like Consuls, Senators, and Governors. Equestrians the wealthy property owners who chose business over politics were also Patricians. The lower working class plebeians were men without substantial wealth who worked for their living at jobs, a master carpenter / architect would fall into this class. Freed slaves who had either been given their freedom or had paid for their freedom and now worked for their living, carpenters for the most part fell into the slave class or if skilled a guild (collegia). Freedmen were often highly educated and made up the bulk of the civil service during the early Empire the majority however, joined the plebeian classes, and often worked as farmers or tradesmen. Slaves were generally prisoners of war but sometimes abandoned children who were owned by their master. Higher the class the more voting power was unfair but it was a big change from other civilizations where the average person had no say at all. In Rome, the regular people could band together and have considerable power through the Assembly and their Tribunes. Much of Roman politics, particularly during the republican age, was to do with the struggle for rights and the sharing of power between the Plebeians and Patricians. They were rather like two political parties. Something which may seem totally bizarre is the situation whereby the poorest plebeians might actually sell their children or even themselves into slavery so as to be able to have access to the houses of the rich and hence some hope of an education and future. Another means of escaping their dire situation was to join the army to gain a hope of a fixed albeit small salary, a cut of the war spoils and eventually a pension and parcel of land to raise their family on. 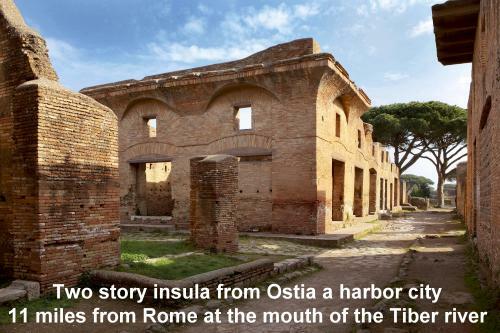 Slave labor became one of Rome's greatest sources of economic wealth. Buildings were contracted by the Repubulic for public use or by wealthy individuals for the community. Slaves and soldiers were used to do the actual construction. An interesting note to give you an idea of class structure is something as simple as water use. 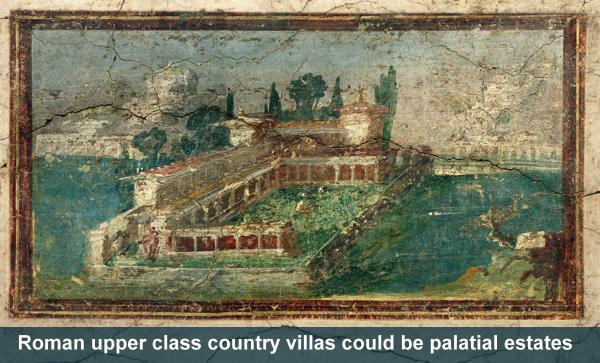 The upper patrician class would have spacious villas, rather than live in the "insulae" tenements. Lead pipes brought water to the houses and were taxed according to size, they were constantly bribing water officials to tap (a problem called puncturing) into aqueducts. 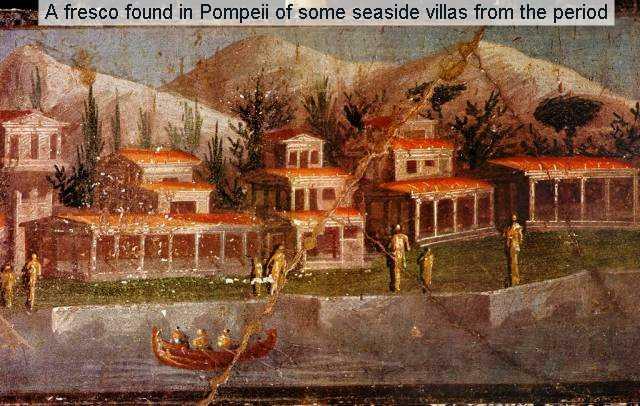 Archaeologists can usually tell the wealth of an owner of a Roman house by simply looking at the size of the pipes. Another consideration important to Roman carpenters was the census, one of the foundation stones of their civilization. Every five years, each male Roman citizen had to register in Rome for the census to declare his family, wife, children, slaves and riches. If he failed to do so his possessions would be confiscated and he would be sold into slavery. Registration was the only way that a Roman could ensure that his identity and status as a citizen were recognized. A master wishing to free his slave needed only to enter him in the censor's list as a citizen, so it was a way for carpenters to climb the social ladder. Fathers registered their sons, employers their freedmen. To the Romans the census made them more than a mere crowd, it made them a populus, a political and military community. Primarily the census served to count the number of citizens and to assess the potential military strength and future tax revenue. A way to impose the dreaded collatio lustralis, a crushing tax on merchants, moneylenders, and craftsmen. The higher positions in the hierarchy the censors would scrutinize each man, carefully evaluating his riches and his rank and might decide to move a citizen down a few rungs if he had, for example, committed perjury, fathered no children, or failed to cultivate his land properly. In assessing the lower ranks of Roman society like carpenters, little was taken into account but their material belongings. 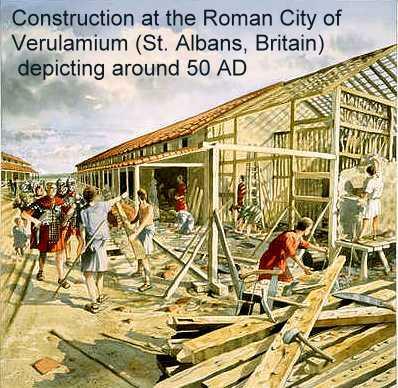 The Roman construction labor force consisted of slaves, freedmen, poor citizens, soldiers from the Legions, and skilled labor. 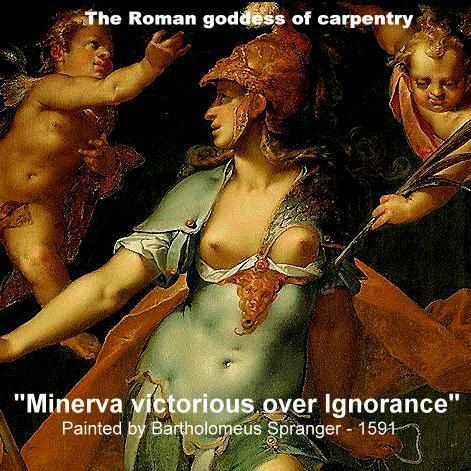 Carpenters for the most part fell into the slave class or if skilled a guild (capenters collegia), a skilled carpenter was known by the general term faber tignarius, literally, a beam craftsman. Roman working men would usually get up early and work a six hour day, women for the most part stayed at home, even the task of lining up for the tokens which granted a family its monthly grain dole was done by the men of the house. 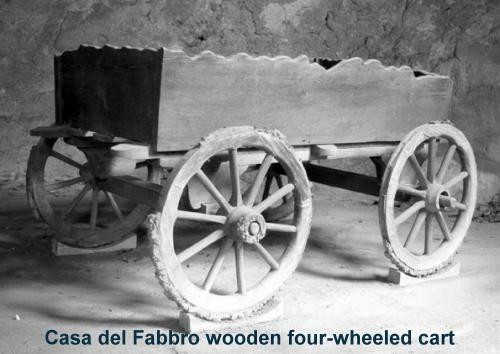 From the little we know about the lives of carpenters and of the organization of ancient workshops when it comes down to individual craftsmen working on small projects or a closely related group they tended to work in a room at home, if the excavations of the House of the Craftsman (Casa del Fabbro) in Pompeii is any guide. Tools were expensive, handwork was slow, and physical space for a workshop limited so most capenters tended to work in small workshops staffed by one or more master craftsmen and their apprentices. Romans made no distinction between the professions and trades. On larger projects a master carpenter / architect would have typically been the designer, responsible for all construction of the project and administering the engineers, trades and labor for the contracts. Aside from the employment of soldiers from the Legion and government slaves, which were common in the ancient states and the main construction force behind the building of large projects, and excluding the many military roads, bridges and fortifications, the master carpenter possessed the same basic function of our modern contractors. The Romans employed highly sophisticated oral and written contracts that were explicit in assigning detailed responsibilities for all parts of the job, including labor and materials, there were even arbitration clauses. Building projects were not usually initiated by the craftsmen themselves they had to tender for contracts either privately or through their collegia and the concept of a general contractor building developer was also not in common usage. A notable exception to this was a guy named Marcus Crassus who ended up being one of the richest aristocrats in the empire, perhaps best known for putting down the Sparticus slave rebellion. He used a little "fire sale" scheme where he would send in slaves to fight the fire of a burning building then ask the owners of surrounding properties if they wanted to sell their endangered properties or watch them burn as well. He used his wealth (8 billion today) to back Julius Caesar, basically, and was given Syria as his province where he royally screwed up an attempt to conquer Parthia for it's great source of riches. A popular but historically unreliable story later emerged that after Crassus' death, the Parthians poured molten gold into his mouth as a symbol of his thirst for wealth. In the carpenters collegia and through apprenticeships math and practical engineering would have been gaurded as trade secrets and advanced. The upper class patricians restricted to a career in either the army, law or politics would have deemed the professions too lowly for their kind. So it was the carpenters that developed materials and techniques that revolutionized Roman engineering accomplishments, improved the daily lives of Romans and helped Rome maintain its dominance in Europe and the Mediterranean for centuries. Numa, the early second Roman king (700 BC) organized the construction guilds which existed in most towns and cities. These associations of artisans, known as collegia, were occasionally regulated by the state but in early times largely left alone. They were organized along trade lines and possessed a strong social base, since their members shared religious observances and fraternal dinners. It was the guilds that provided the skilled labor, they were not collective bargaining devices like unions, but each collegium represented an individual trade or craft and would have tendered for contracts for work in their specific area rather than for an entire building contract. 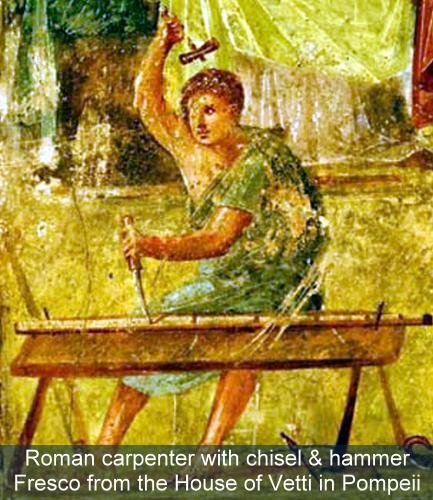 By the early fourth century Roman carpenters were required to belong to their appropriate guild, this was one way the government could locate and impose a crushing tax every five years on the craftsmen. By this period the individual had lost even his freedom to switch occupations, a son of Roman carpenter was virtually bound to follow in his fathers’ footsteps. 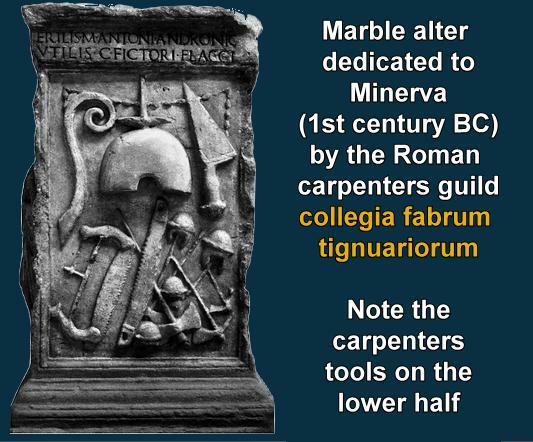 In Rome members of the collegium fabrum tignuariorum ("those who work with beams of wood," or "carpenters") set up an altar to their patroness Minerva, goddess of crafts, where you can still find the stone surface of the dedication intricately carved with the tools of their livelihood. In over 1200 years you would think there would have been more invention but the mathematical revolution of the Greeks ground to halt. Roman numerals date back to 800 BC and were developed for a standard counting method it was a decimal (base 10) system, and did not include a zero. The Romans had no use for pure mathematics, only for its practical applications, no mathematical innovations occurred under the Roman Empire and Republic, and there were no mathematicians of note. Advancements were often divided and based on craft and the carpenters guarded technologies as trade secrets. Most practical Roman innovations were copied as they assimilated cultures with their war machine but they had a tendancy to vastly improve what they worked with especially when it came to building. Roman architecture borrowed heavily from Greek building design and proportion adding two new orders of columns, composite and Tuscan to the classic order. Roman carpenters were also the first to fully understand the structural advantages of an arch which has far greater capabilities than the lintel and the dome is in effect a collection of arches all sharing the same center. 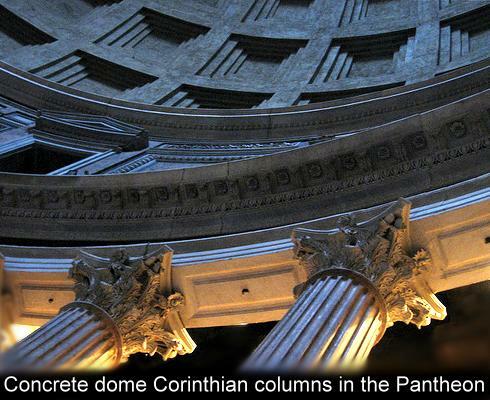 The Roman use of the arch and concrete allowed for the construction of impressive buildings such as the Pantheon still standing as a testament to their superior engineering skills and ingenuity. 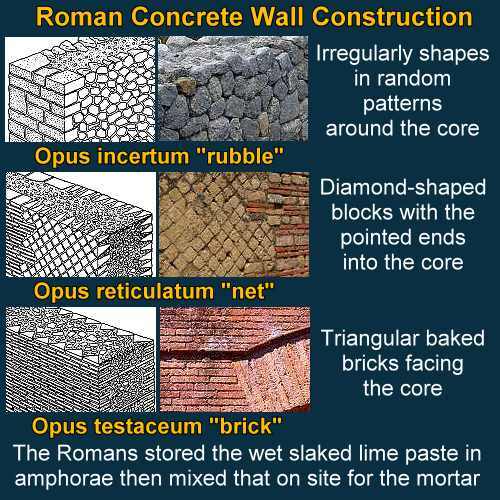 One of the most important Roman contributions to building technology was the advance of Bedouin concrete from Jordan who were using sandy volcanic ash mixed with lime and then heated it in the same kilns they used to make their pottery (700 BC) and the Greek concrete using natural volcanic material and lime (600 BC). 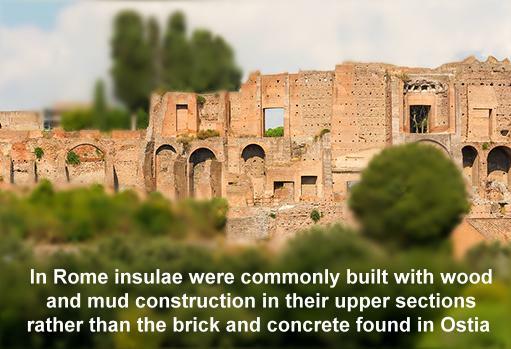 By 200 BC the Romans had two distinct types of concrete mortar one was made with simple lime and river sand the other type used pozzolan, from the Pozzouli region by the Bay of Naples where it was found, creating an exceptionally strong bond with the aggregate. In addition to using natural pozzolans, the Romans learned to manufacture two types of artificial pozzolans, calcined kaolinitic clay and calcined volcanic stones, evidence of a high level of technical sophistication for that time. 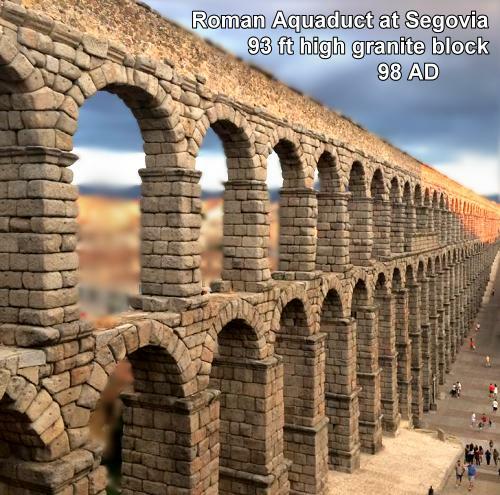 They took the Etruscan arch to remarkable new engineering feats with gigantic aqueduct structures like the one located at Segovia with a one percent slope over 10 miles using single and double arches almost 10 stories high 93 ft (98 AD). 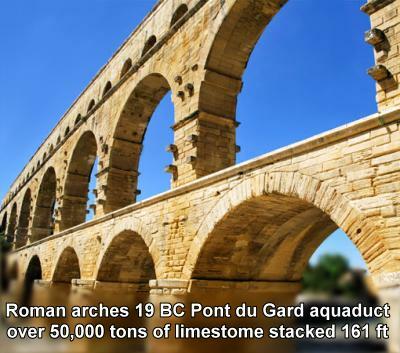 Aquaducts like the 4000 year old Persian qanats already existed before the construction of Romes first, the Aqua Appia (312 BC), but the Romans built on an unprecedented scale. 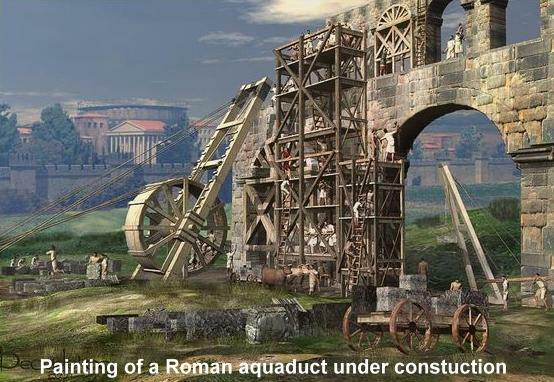 Rome alone was supplied by 11 aqueducts with a combined length 220 miles, the Aqua Marcia (144 BC) for example ran 57 miles underground then 6 miles aboveground and if a valley needed to be crossed they used inverted siphons. The Roman carpenters first built wooden arches on which sat the arch stones, voussoirs and key stones. 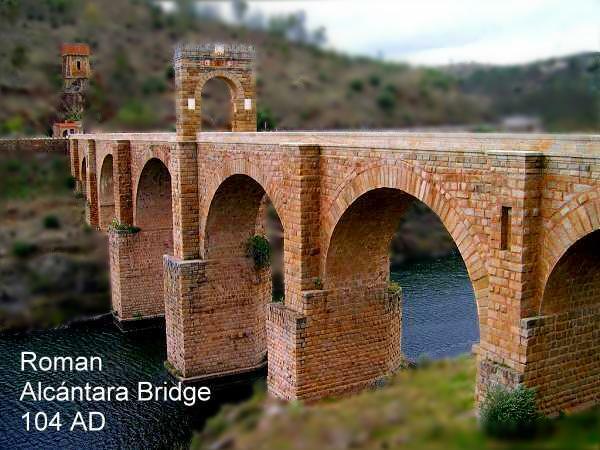 Some like the Alcántara Bridge (104 AD) weighed up to eight tons each with arch spans up to 98 ft, the overall bridge was almost 3 football fields long 984 ft and 200 ft high, an impressive enough feat and although having re-built sections is still standing today. They built over 900 bridges in the empire reaching 26 modern countries and were the first to use the segmental arch and concrete. Some of the important projects by carpenters that vastly improved Roman life were their construction of watermills. The Barbegal mill in France for example was able to process about 4.5 tons of flour per day enough to supply bread for as many as 10,000 people. 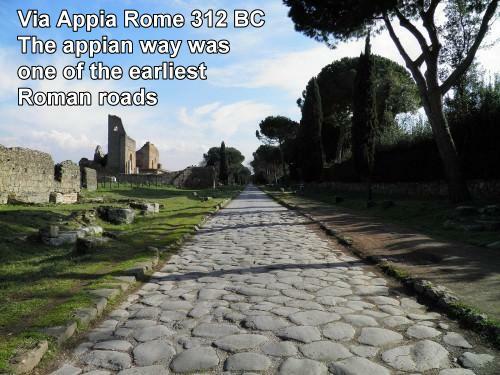 Also impessive was their 75,000 miles of road network that stretched from northern England to southern Egypt which was the origin of the saying "all roads lead to Rome". Originally constructed to allow Roman legions to be rapidly deployed their economic importance to carpenters was probably also significant, although wagon traffic was often banned from the roads to preserve their military value. 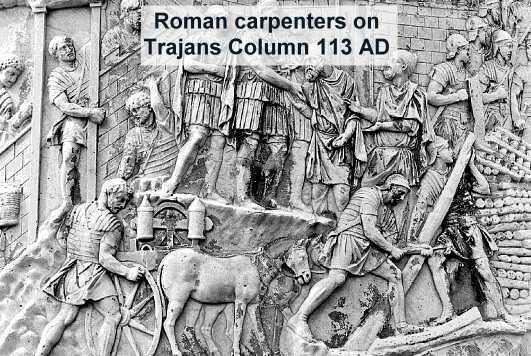 The Roman carpenters in the military also developed formidable weapons that for centuries gave them an advantage in the battlefield and allowed them to conquer vast territories. You often see mention of important battles being turned by carpenters building bridges on the fly or siege towers like the 10 story tower bristling with artillery in the siege of Uxellodunum in Gaul in the 1st century. Marcus Vitruvius Pollio was the author of De architectura, known today as The Ten Books on Architecture. Written in approximately 20-30 BC it is the only major surviving work on architecture from classical antiquity. He was as much a historian as he has become one of the most famous architects, not for anything he designed as Vitruvius the theorist left little mark on the official Roman architecture of his time and much of the material also appears to have been taken from earlier extinct treatises by Greek architects. 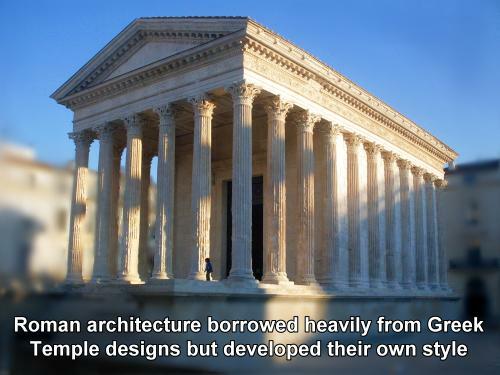 That said though it's in Vitruvius that we first see the beautiful balance of the classical orders of Greek architecture, Doric, Ionic, Corinthian that we still use today. He believed that an architect should focus on three central themes when preparing a design for a building: firmitas strength, utilitas functionality, and venustas beauty. His were the first texts in history to draw the Greek connection between the architecture of the body and that of the building, that a timeless notion of beauty could be learnt from the 'truth of nature', that nature's designs were based on universal laws of proportion and symmetry. De architectura was rediscovered in 1414 by the Florentine scholar Poggio Bracciolini, and along with contemporary books like De Re Aedificatoria by Leon Battista Alberti in 1485, it deeply influenced the Renaissance artists, thinkers, and architects prompting the rebirth of Classical architecture. Inspiring artists like Michelangelo (1475-1564) and Leonardo da Vinci's (1452-1519) whose best known drawing the Vitruvian man, which is based on the concepts of proportion developed by Vitruvius. 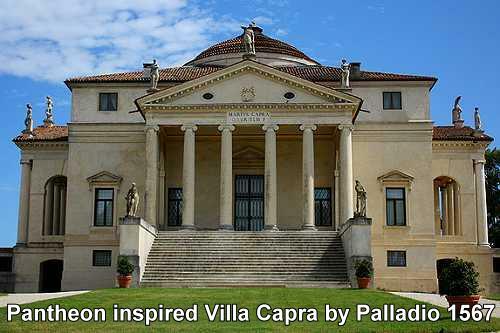 Great architects like Andrea Palladio (1508-1580) considered Vitruvius his master and guide, and made some drawings based on Vitruvius' work before conceiving his own architectural designs. English architect Inigo Jones (1573-1652) was also among those that re-evaluated and implemented the disciplines that Vitruvius considered a necessary element of architecture. Without Vitruvius' look longingly to a time before imperial Rome back to classical Greece who knows, we may have lost the classic architecture of the ancients. Vitruvius compares the origins of the classical orders to the symmetry of men and women. "In the invention of the two different kinds of columns, they borrowed manly beauty, naked and unadorned, for the one, and for the other the delicacy, adornment, and proportions characteristic of women..."
"On finding that, in a man, the foot was one sixth of the height, they applied the same principle to the column, and reared the shaft, including the capital, to a height six times its thickness at the base. 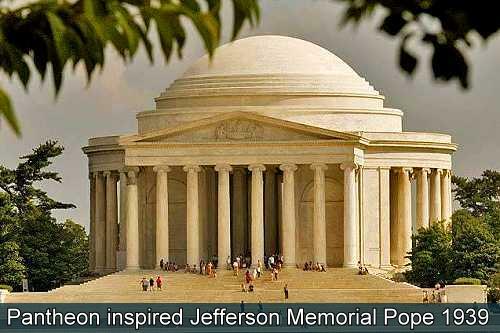 Thus the Doric column, as used in buildings, began to exhibit the proportion, strength, and beauty of a man." 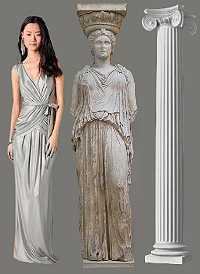 "Just so afterwards, when they desired to construct a temple to Diana in a new style of beauty [Ionic], they translated these footprints into terms characteristic of the slenderness of women, and thus first made a column the thickness of which was only one eighth of its height, so that it might have a taller look. At the foot, they substituted the base in place of a shoe; in the capital they placed the volutes, hanging down at the right and left like curly ringlets, and ornamented its front with cymatia and wide festoons of fruit arranged in place of hair, while they brought the flutes down the whole shaft, falling like the folds in the robes worn by matrons." "The third order, called Corinthian, is an imitation of the slenderness of a maiden; for the outlines and limbs of maidens, being more slender on account of their tender years, admit of prettier effects in the way of adornment." The Pantheon from the Greek words pan and theon, which mean all and gods and is one of the most imitated buildings in history. Legend says that the ancients built it on the site where Romulus the mythological founder of Rome ascended to heaven in 716 BC. It has been called a perfect space because the diameter of the dome is equal to that of its height, a circle in a cylinder in a square. When Michelangelo saw it he proclaimed it was of "angelic and not human design" and suspected that portions of the Pantheon were built by different architects who had varying levels of skill. The original design of the highest classical architectural excellence was most likely by Greek builder Apollodorus, who was sentenced to death for critisizing this reconstruction by emperor Hadrian from 118 to 128 AD. Hadrian had a strong interest in architecture which may have led to some of the major problems for the carpenters. 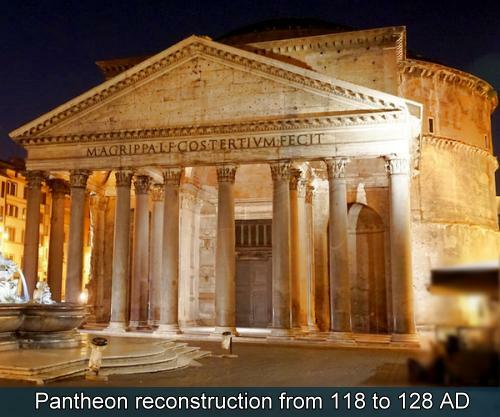 In 609 AD the Pantheon was stripped of all pagan deities when it became a church dedicated to the Virgin Mary and all the martyrs, but doing so saved it from ruin because the church dedicated a great deal of wealth to maintain the building. 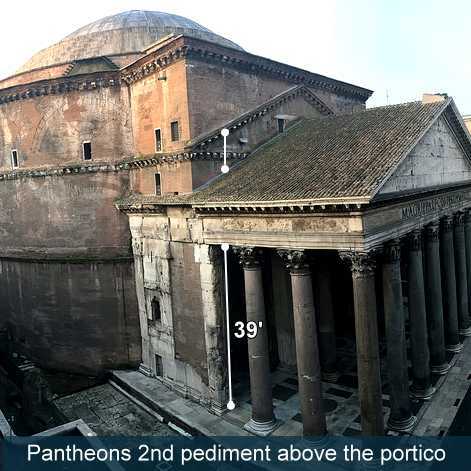 The Pantheon was built on marshy, unstable river clay which gave a serious uneven settling problem. In the construction phase the foundation cracked at the two ends of the North-South axis under the 7 story 20'-4" thick walls so they built a second ring to stop the first from cracking further and to give more area for support. Initially the width of the foundation ring was 23'-7" wide, only about 3 feet greater than the walls it supported, the carpenters formed a second ring adding another 10 feet making the total width about 34 feet and from floor level to the bottom of the foundation was 15'-4". They then also built buttress walls on the south side opposite the porch to keep the crack from extending which appears to be an additional room, but it only serves the purpose of being part of the connection. 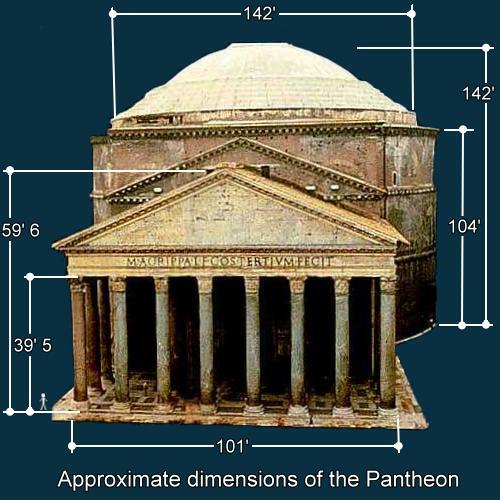 The Pantheons basic design is simple and powerful, a rectilinear portico with free-standing columns with a intermediate block above that is attached to a round domed rotunda. The 40 ton 21 foot high double bronze doors would have been covered in gold and the exterior stucco with white marble paneling, the once bronze-tiled roof and bronze portico beams were melted down for 80 cannons at Castel Sant'Angelo. The Greek colonnade is 16 columns with Corinthian capitals they are 39 feet high 5 feet in diameter and each a 60 ton masterpiece of carved Egyptian granite. The pediment would have had a sculpture likely an eagle within a wreath of gilded bronze. There is another shallow pediment above that would have allowed for continuity between the porch and intermediate block that is lacking in the current structure. The carpenters probably had to adjust the height when the larger 50 ft columns were instead used for the Temple of Trajan, which was being built by Hadrian around the same time for his adoptive father. Probably to show respect for Trajan as the size of the columns was very important to the Temple since it dictated the size of the entire building. The interior was redesigned in the Roman style when converted. The floor gently sloped to allow for runoff of rainwater with the original designed marbles from the four corners of the Empire which can be understood as expressing conquest of Egypt, Asia, Carthage and Gaul in a squared circle as in the geography of Ptolemy. Circles and squares form the unifying theme of the interior design. The domes interior for example feature square coffers in five rings of 28 one of the four perfect numbers known in antiquity, a whole number whose summed factors equal it, considered by the Greek Pythagoras to have mystical, religious meaning in connection with the cosmos. 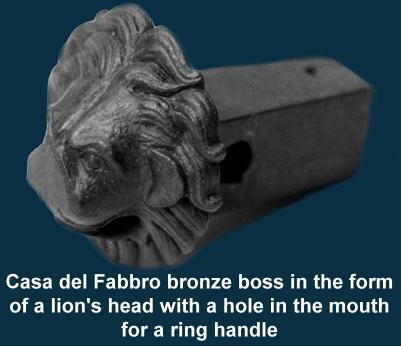 The coffers may have originally contained bronze stars or rosettes. 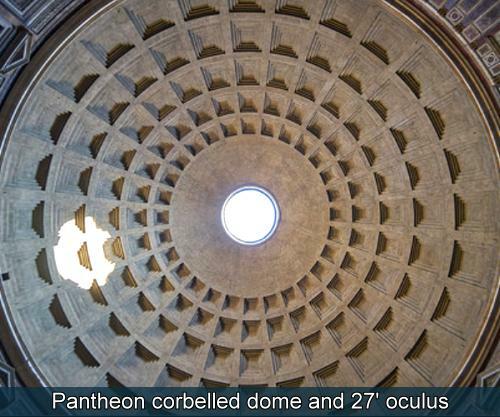 The 27 foot oculus at the top of the dome is the interiors only source of direct light, also in keeping with the belief that there should not be a roof on a Roman temple. During the equinoxes including April 21, the traditional founding date of the city of Rome, a lighting effect can be viewed when the midday sun casts a single sunbeam that illuminates the doorway. The dome is 142 feet in diameter, for comparison the U.S. Capitol dome is only 96 feet. It is still the largest un-reinforced dome in the world and was the largest of any dome for over 1,300 years. It is carried by eight barrel vaults in the drum wall to piers, the standard overall width at the piers is about 20'-4" but the curtain wall on the side of the large niches is reduced to 7'- 4". The dome is 19'-8" thick at the base which reduces to 5 feet thick at the top has an oculus that is 27 feet in diameter. The caprenters formed 7 outside rings with the first resting on the center of the main wall, it is 7'-6" and steps in to the next ring about this same distance. The remaining 6 step-rings are 2'- 6" and also corbelled inward 4 feet much like placing a series of washers, one above the other with their diameters decreasing as they are stacked. Each ring took enough time to give the pozzolan cementing materials time to cure and gain strength to support the next upper ring. 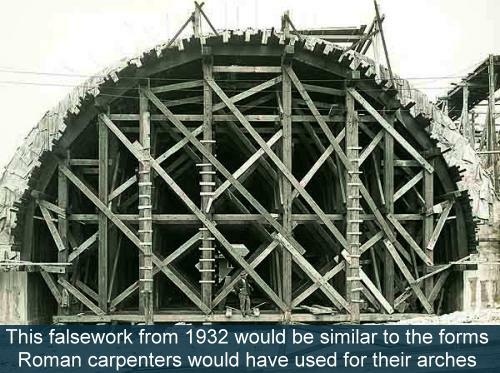 The carpenters would have also built a 7 story elaborate setup of wooden beam scaffolding to support the circular part of the upper dome and formed the waffle like coffers. The dome was an engineering feat that wouldn't be attempted today without rebar. The empire covered such a vast area and lasted such a long time that the housing, as in any time or place, was varied and largely determined by the materials available. In Italy however two main types of housing emerge. 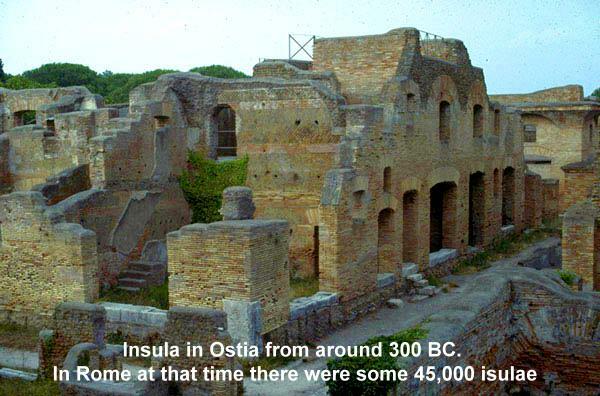 In the cities like Rome or Ostia the average person would have lived in a new development called insulae, (Latin for island). These were often four or five story high rise tenement blocks with the poorest families crammed into just one or two rooms located in the highest apartments. Most would have a shop like a bakery on the first floor or a carpenter would have located his specialized woodworking shop. You would have used communal facilities for essential services such as cooking and bathing or one of the fountains for water. The lower floors may have water piped in which created the problem of chamber pots being dumped out the upper floors even though there were laws against it. They were death traps often hastily and shoddily built and terrible fire-hazards, though some emperors tried to restrict the height and materials used. 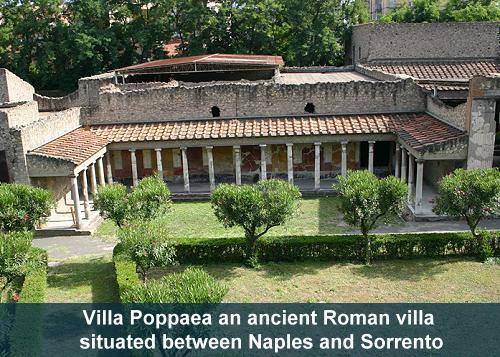 Wealthier Romans generally lived in villas or domus, (dominus meaning lord) of one or two levels with a country estate often even more ornate. The villas varied in plan but similar to the original Greek open courtyard designs. They usually comprised of an entrance area or atrium, onto which opened several rooms, including bedrooms. Beyond the atrium was an open, colonnaded courtyard, often containing an ornamental garden with plants, water features and sculpture. Rooms opening onto the courtyard included the triclinium three couches or dining room, and tablinum or office-records room. The back had service areas such as the kitchen, store rooms and latrines. Well-appointed houses were decorated with mosaic floors, painted walls and ceilings, and bronze and marble statuary of gods and ancestors. 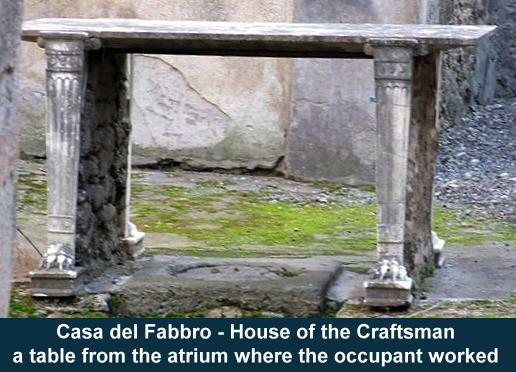 Casa del Fabbro or House of the Craftsman is an example of a Roman house excavated in Pompeii that may be representative of a carpenters home and workshop. 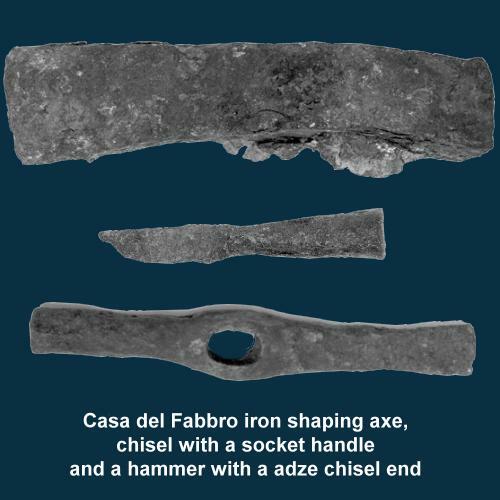 This house was found on the west side of the Casa del Menandro, which occupied over three-quarters of the Insula, and is a relatively small home 3500 sq ft. It has an average standard size garden plan but with rooms along the west side of the front hall only on the groud floor which was the only entrance to the street. The entertainment area of the house had been converted into a shop and the rooms off the hall mainly for storage of trade materials. 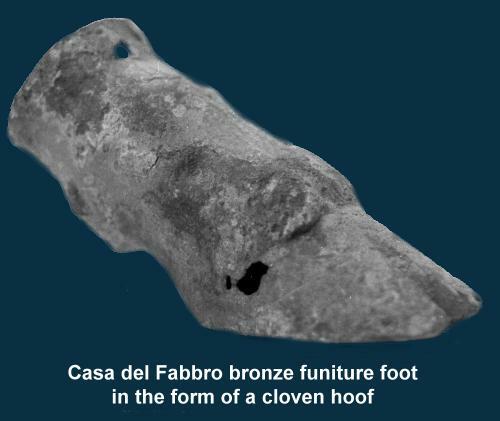 A small four-wheeled cart was discovered in the central intercolumniation and a large number of bronze furniture fittings and iron tools to suggest the owners principal occupantion was a cabinetmaker, (Elia excavation 1933). 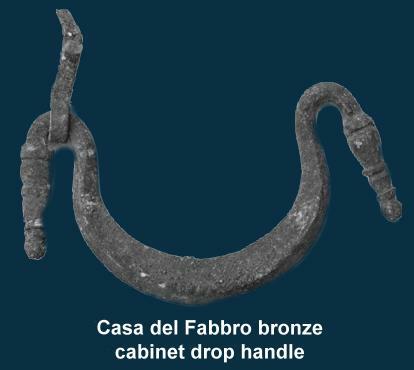 Among the items excavated they found bronze furniture fittings, cabinet bosses, hinges and handles a bronze measuring rod, dividers and compass. Pieces of worked and partially worked bone, probably for furniture decoration, and one bone-decorated iron furniture foot. The specialized iron tools included a large quantity of chisels straight and curved, whetstones, saws one with a wide blade, axes, files, knives, pliers, hammers and mallets. There were also smithing and other carpentry tools suggesting the owner could have also did handyman type of work.